Preliminary design prepared for the Fiscal Year 1917 destroyers, which became the Wilkes (Destroyers # 75) class. 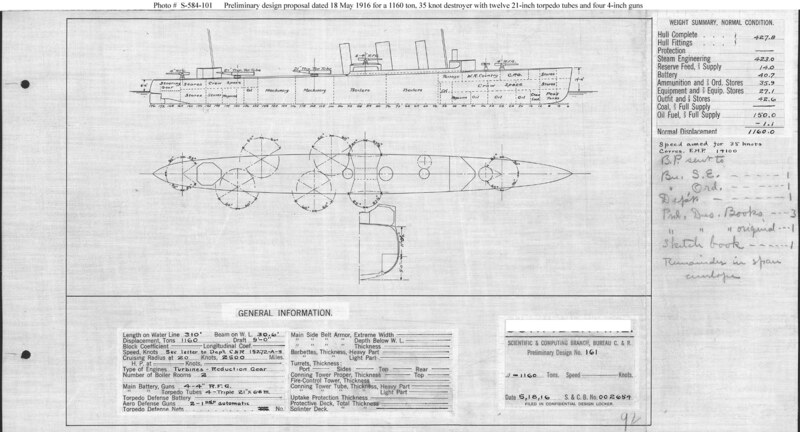 This plan provides four 4-inch guns and a speed of 35 knots in a ship 310 feet long on the load water line (L.W.L. ), 30 feet 6 inches in beam, and turbine machinery, with a normal displacement of 1,160 tons. This design differed from the original concept (see Photo # S-584-085), underlying the General Board characteristics promulgated in October 1915, by adoption of a modified hull form that required 1 foot deeper draught allowing a more horizontal placement of propeller shafts, and thus enabling the higher estimated speed of about 35 knots.